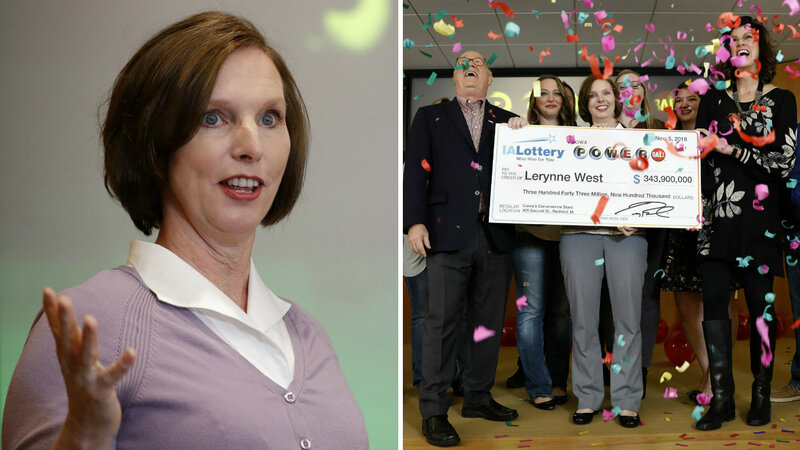 After hearing someone from Iowa had won half of a nearly US$700 million Powerball jackpot, Lerynne West couldn&apos;t find the ticket she&apos;d bought the day before so asked her sister to check her pickup truck. There it was, on the pickup floor — a scrap of paper worth a share of US$688 million ($954.25 million). "Nobody believed me," Ms West said Monday after submitting her winning ticket at lottery headquarters in suburban Des Moines. She will share the jackpot drawn on October 27 with someone who bought the other winning ticket in New York City but hasn&apos;t claimed the prize. Ms West took the cash option, which will pay her an immediate US$198.1 million ($274.76), minus taxes. Ms West, 51, said she dreamed of winning a jackpot, but "once you have won, you realize the responsibility and the impact you can make, and all the frivolity goes out the window." She said she&apos;ll give some to her daughters and other relatives, ensure her six grandchildren can have college educations and set up the Callum Foundation, where people in need can seek financial help. Halting briefly to hold back tears, Ms West said the foundation was named after a grandson born prematurely in April who lived only one day. Ms West said she grew up in a "very humble family" with seven siblings in Iowa and knows what it&apos;s like to struggle financially. She worked in corn and soybean fields as a teenager, didn&apos;t graduate from high school but earned a GED diploma and took night classes to get a college degree in human resources in 2006. She worked at a health insurance organization until winning the jackpot. "Currently, I&apos;m retired," she said. She plans to buy a new house and replace her car, a Ford Fiesta with 142,000 miles (228,500 kilometres) "that people have beat up." West bought the ticket in Redfield, a community of 800 people about 30 miles (50 kilometres) west of Des Moines. "I played the lottery twice a week, when I had the money to do it," she said. The drawing came only four day after someone won a US$1.54 billion ($2.14 billion) Mega Millions jackpot, the second-largest lottery prize ever. That ticket was sold in South Carolina and hasn&apos;t been claimed.